Submitted by webmaster on 10/09/2018 - 10:55. Leaving the sea behind you, if you look towards Piazza San Marco you can cleary see two columns, one with the famous winged lion of the Serenissima and the other with a warrior that subdues a dragon: this warrior is San Teodoro, the first patron saint of Venice, who was replaced with San Marco starting from 828, the year in which the relics of San Marco were brought to Venice by two Venetian merchants from Alexandria in Egypt. 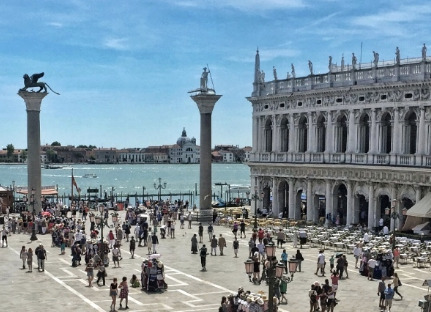 Even the Basilica di San Marco now stands where the old church dedicated to Teodoro used to be (if you want a modern and comfortable accommodation near Piazzetta San Marco SEE OUR OFFER!). 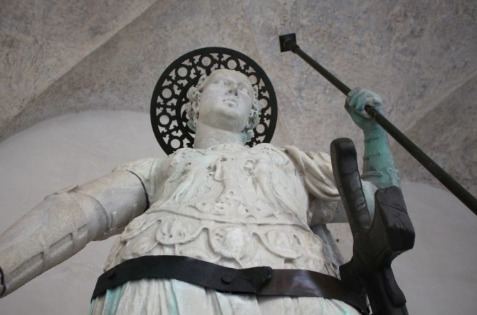 The statue of San Teodoro (Todaro in the venetian dialect) can be regarded as the symbol of the multiculturalism of Venice: its armor is made of the same marble used for the Parthenon, the head and the bust come from statues of Roman emperors, the shield is in Istrian stone while the legs, the arms and the dragon are made with a marble coming from an island located between the Aegean and the Black Sea. The two columns that support San Todaro and San Marco come from Constantinople and it seems, according to Francesco Sansovino, that at the beginning there were three (if you like a ‘classical’ style for your accommodation SEE OUR OFFER). The interesting thing is that the columns were left on the ground for a long time since it was very difficult to put them in the vertical position. However, in 1172 Nicolò Barattieri, using a particular counterweight and a system of levers, succeded in the operation and it seems that the Serenissima was so enthusiastic about his work that it granted him with the permission to manage a gambling house, which at the time strictly forbidden in the city (and it is interesting to point out that the gambling house was located right in the area between the two columns). 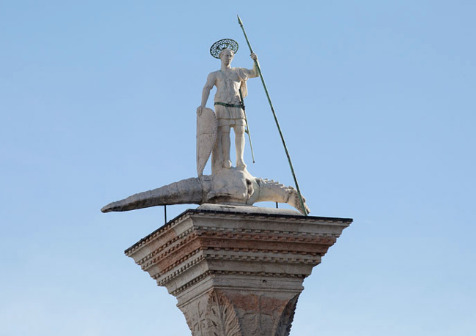 If the statue of San Marco is still the original one, that of Todaro was removed in 1940 and replaced with a copy. The original was first brought to the Abbey of Praglia in Padua and then it found its definitive location in the courtyard of the Senators at the entrance to the Doge's Palace.